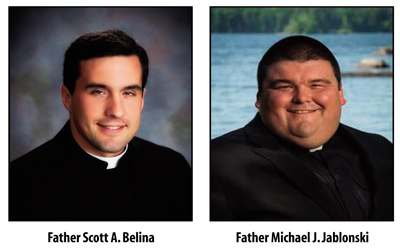 OGDENSBURG – Bishop Terry R. LaValley has announced that effective Sept. 26, Father Michael J. Jablonski will become parochial vicar at St. André Bessette Parish in Malone, and Father Scott A. Belina will become parochial vicar at St. Peter’s Parish in Massena. Father Belina was ordained May 25, 2013 and served as parochial vicar of St. Mary’s Cathedral with additional duties at the Chancery Office until the summer of 2015, when he became parochial vicar at St. André Bessette Parish in Malone. A graduate of Immaculate Heart Central in Watertown, Father Belina graduated from Clarkson University in Potsdam with a bachelor’s degree in biomolecular science before he began studying for the priesthood at St. Charles Borromeo Seminary in Wynnewood, Penn., where he earned a Master of Divinity and a Master of Arts in theology. Father Jablonski is currently serving in his first assignment since his May 2017 ordination at St. Peter’s Parish in Massena. A native of St. Johnsville in Montgomery County, Father Jablonski graduated from high school in 1999 from Oppenheim-Ephrataha Central School and earned an associate’s degree in social sciences from Herkimer County Community College, a bachelor’s degree in history from Utica College of Syracuse University and a master’s degree in education from the Franciscan University of Steubenville, Ohio before beginning studies for the priesthood. He attended seminary at the Pontifical College Josephinum, where he received a Master of Divinity degree.